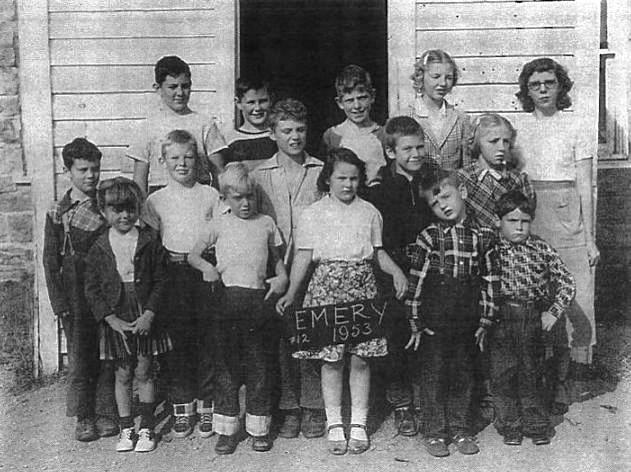 The Emery Public School was located on part lot 20 of the third concession on Marble Rock Road in the township of Leeds and the Thousand Islands. 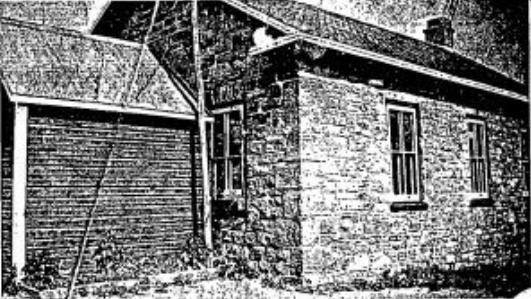 The original stone school consisted of a porch attached to the front of the stone building and a wood shed to the side of the building. The land was originally granted by the Crown to William Emery Sr. in 1799. During the mid 1800’s, the Emery family gave land on the south side of the road, and a frame school was built. Some time after 1850 the stone school was built on the north side of the road, on land also donated by the Emerys. Over time, additional lots were severed to accommodate the large Emery family and other newcomers to the area. The last teacher at Emery School was Mrs. Marion McKay in 1959-60. The school closed in June 1960 and the pupils moved to William Hiscocks school. The building remains today and has been converted to a residence. During the mid-eighteen hundreds, the Emery family, who lived where the Campbell Clendenning farm now is, gave land for a frame schoool-house to be built on the side of the road opposite of our present site. After 1850, the present school, built of stone, was erected on land that was part of the farm now owned by Firman Carpenter. The old school, we hear, was moved to the Emery farm to become a pig pen. Mr. Gibson Haig was a pupil in this present school in 1877. In 1947, an acre of land was procured from Firman Carpenter to make the playground large enough for playing games. Some of the earliest teachers were: Miss Stevens, Miss LaFrance of Howe Island, and Miss McCammon. These ladies taught here before 1900. Early in 1900 came Miss Margaret Haig, who was the sister of Mrs. Wm. Clarke; Miss LaChance; Miss Chant from Chantry, and Miss Florence Carpenter, now Mrs. Moore. 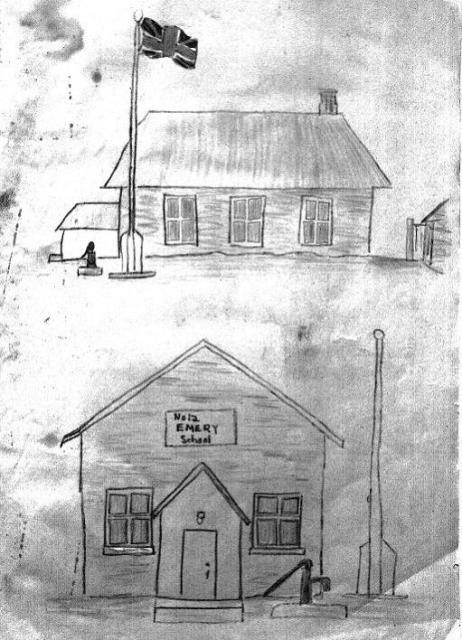 Miss Susan Sheppard and Mr. Robert Sheppard are thought to have been teachers in the old log school across the road. In the school, we find some of the old registers. The first one is for 1905-6 used by Miss Emma Gray, now Mrs. John Post of Eldorado. At this time, the registers began in January and closed in December. Each year a new book was used. There were 27 pupils in that year. Some of them were Edith Andress, Almeda Perry, Mildred Heasler, Harold Brown, Hazel Haig, Ford Haig, Orma Haig, Martin Carpenter and Charles Andress. Mr. Lorne Yule was the teacher in 1906-7 while Miss E. Gray attended Normal School. She returned for the year 1907-8. 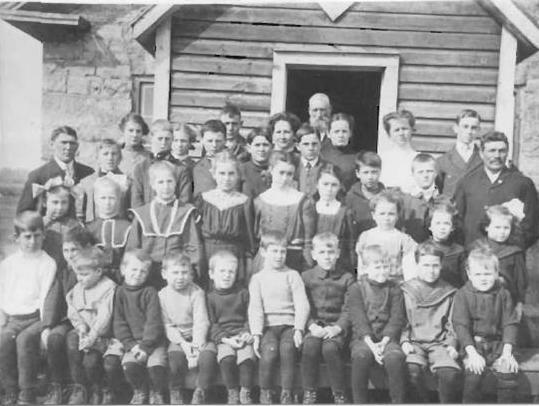 In the fall term of 1908, there were two teachers - Mr. W. D. Stevens and Miss Blancher. Miss Rita Carpenter taught from January 1909 until June of that year. She was succeeded by Miss Katie Sykes who was here until June 1910. Beginners were Oliver Perry and Teddy Boyle. In September 1910, the teacher was Miss Mollie Garvin. Miss Neilson taught from January 1911 until June of that year. Miss Jennie Hazelton was here for the year 1911-12. Miss H. Drumm taught the fall term in 1912 to be succeeded by Miss Gertrude Aiken, who is now Mrs. Firman Carpenter. Teachers following were Miss Rae Gallagher, Miss Clancy, Miss Hutcheson, and Mr. Terry Scanlon. Some of the pupils were Marie Boyle, Donald Shaw and Leonard Perry. Miss Ethel Armstrong, of Brockville was engaged as teacher in 1914. She is now Mrs. Clark and is teaching on the staff of the Linklater Public School in Gananoque. Miss Mason followed the next year, but became ill and at Easter, Miss Mamie Melville came and stayed until 1917, when Miss Hazel Haig, a former pupil of this school became teacher. Miss Haig became Mrs. Homer Shaw and resides in Perth. When Miss Haig attended Normal in 1918, Miss Sue Thompson taught here. She became the very well-known Dr. Sue Thompson and moved to United States. In October of the next year, when Miss Haig returned, there was a severe Influenza epidemic which necessitated closing the school for one month. Mr. J. F.McGuire was Inspector of Public Schools at this time. Dental inspection was carried out at the school by Dr. Mabee and Dr. Stedman. The year 1920, the teacher was Miss Myrtle Weir of Omemee. She boarded at Mr. Carmen Day's. Miss Agnes Davidson, Miss Edith Swerdsfigger of Mallorytown, and Miss Anna Munroe, who is presently teaching in Willowbank School, were the next teachers. From 1929-32, Ella Nuttall, now Mrs. Hilliard Jackson, taught, and she was followed by Miss Aleta Barrett, now Mrs. Reg Hill, from Christmas 1932-33. Miss Sadie Allen, now teaching on the staff of Prescott Public School was here from 1933 until 1937. Some of her pupils were Blanche Shaw, Nobel Andress, Blain Reed, Mabel Andress, Arnold Carpenter, Eric Clendenning, Ralph Heasler, Keith Compeau, Irene Carpenter and George Andress. In 1937, Miss Helen Wright, now Mrs. Gordon Atkinson of Joyceville, came, staying until 1939. Some of her pupils were John Nuttall, Mary Carpenter, Hubert Perry, Alice Andress, Margel Reed, Thelma Nuttall and Baden Haird. Miss Doreen McNeely, now the present teacher Mrs. Wm DeWolfe began her teaching career here in September 1939. She stayed until 1941, when she went to Brockville to teach Grade 1 in Douglas Haig School. She was followed by Mrs. Effie Kenedy, who stayed until June 1943. Miss Alice Lynch from Mallorytown came in the fall and left in June 1945 to be succeeded by Mrs. Grace King. Mrs. Edwin Nuttall taught from September 1946 until Christmas when Mrs. Bernice Greer came, finishing the year. In September, Mrs. Margaret Landon of Lansdowne came staying until 1948, when Miss Betty Fodey, now Mrs. Peter McKinnon, of Ottawa, became teacher until her marriage in 1951. Next came Miss Blythe Abrams from Maple Grove. She spent four years here, from 1951-55 when she married Mr. Ronald Jones. The present teacher Mrs. Doreen Dewolfe returned as teacher in September 1955. During her sojourn, students from Ottawa Teacher's College did their practice teaching there. There were inter-school sports activities with Wilstead and Legge's schools as well as field trips also with these two schools.